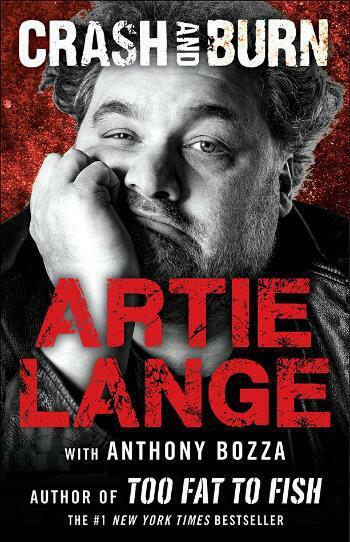 Veteran comedian, radio personality, and #1 New York Times bestselling author Artie Lange will publish his memoir with Touchstone. The highly anticipated follow up to his runaway #1 New York Times bestseller Too Fat to Fish, the memoir, titled Crash and Burn, will be published on October 29, 2013. Crash and Burn is an eye-opening, absorbing, and often darkly funny account of Artie Lange’s near-fatal battle with heroin and alcohol addiction during his tumultuous comedic career and the remarkable story of his recovery. Written with his longtime collaborator, bestselling author Anthony Bozza, Crash and Burn reveals the stories behind Artie Lange’s drug-addled departure as a personality on “The Howard Stern Show,” his public implosions, such as his infamous guest appearance on HBO’s “Joe Buck Live” in 2009, and the story behind his apparent suicide attempt in 2010 for which he had to be institutionalized. Crash and Burn recounts the severe battle with depression Artie Lange endured while out of the spotlight and his hard-fought path to sobriety. Readers will learn how staying clean and sober is a challenge he faces daily. Crash and Burn will include a foreword by national sportscaster Joe Buck.